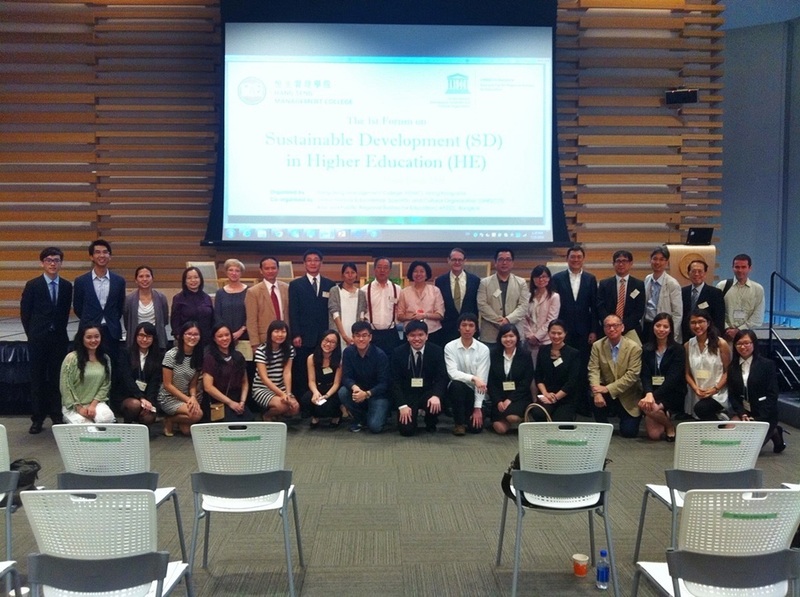 The 1st Forum on Sustainable Development (SD) in Higher Education (HE) was organized by Hang Seng Management College (HSMC), Hong Kong and co-organized by United Nations Educational, Scientific and Cultural Organization (UNESCO) and Asia and Pacific Regional Bureau for Education (APEID), Bangkok and held on 21st July 2015. Hong Kong Quality Assurance Agency (HKQAA) was one of supporting organizations. I was honor to be invited by Dr. Shirley Yeung (Director, Centre for Corporations, HSMC) and I summarized the forum below for sharing. Prof. Robin Stanlye Snell (Professor of Management, Lingnan University) was the first speaker and his topic named "Service Leadership and Civic Engagement through Team-based Service-learning". He introduced Service Leadership through Service-Learning Projects which administered by Lingnan University’s Office of Service Learning (OSL). Prof. Snell said the courses included Introduction to Business, Social Marketing, Corporate Social Responsibility, Leadership and Teamwork, Services Marketing, Strategic Management, and Service Leadership. He explained the definition of Service Leadership that the distributed practice of people-oriented leadership for service. Then Prof. Snell introduced their vision on building Social Sustainability and the model was showed in the following diagram. Dr. Ken Loh (Head of Asia, Kalmar) was the second speaker and his presentation entitled "Sustainable Development in a Corporate Environment". Firstly, he briefed Kalmar was the market leader in container handling equipment, port automation and service. Dr. Loh observed the generation shift (See diagram) and he focused on developing their people in Human Capital (Attraction, Retention & Branding), Knowledge Management (Engaging, Sharing and Genius Bar) and Organizational Development (Change Management, Leadership and Team of Engineers). Moreover, he employed Leadership Program based on 360 degree assessment. Finally, he concluded the key concept was “People Oriented”. Mr. Allen Lee Peng Fei, CBE, JP was the moderator. Mr. Lee observed the new internet world, knowledge based & competitiveness on human being. Then they discussed how important to train leader. During Tea break, I took a photo with Mr. Lee and Dr. Loh, as well as other guests. Before the session 2, I met Prof. Encoh Young (who was Head of Department of Applied Science, Dean of the Faculty of Science and Engineering, Founding Director of the Graduate School and Pro-Vice-Chancellor of City University from 1987 to 1997) when I studied in City Polytechnic for HD in Applied Science in 1989! The third speaker was Ms. Susanna Lee (Head of Consulting, HKCAAVQ) and her topic named "The Role of Quality Assurance in Sustainable Programme Design”. In the beginning, she introduced a Decade of Education for Sustainable Development (DESE) 2005-2014 which integrated the principles, values and practices of SD to address “Social”, “Economic”, “Cultural” and “Environmental Issues” in the 21st Century. 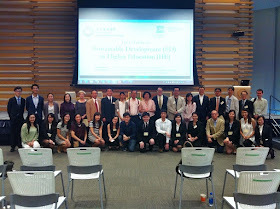 Ms. Lee then introduced Sustainable Development in Hong Kong. She said Environmental Bureau supported to the Council for Sustainable Development finding ways to increase prosperity and improve the quality of life while reducing overall pollution and waste. After that she reviewed SD in higher education (HE) courses and found that only 13 courses entitled Sustainability / Sustainable Development. Reference to UK experience, it could enhance SD in HE courses systematically. The forth speaker was Ms. Leonie Ki Man Fung (Honorary Secretary, Wu Zhi Qiao (Bridge to China) Charitable Foundation) and her presentation was "Using Service-Learning in Educating for Sustainability in Higher Education: Wu Zhi Qiao – Bridge to China Project". Ms. Leonie Ki explained they had two goals included “Bridge for People” and “Bridging People”. The objectives were to improve lives of underprivileged villages in remote areas of Mainland China and inspire respect, appreciation & preservation of local culture & environment, promulgate concept of sustainability, as well as, provide university students a real life experience of executing a service project which has direct impact. In addition, it aimed to foster better communication, mutual understanding & integration between Hong Kong and the Mainland. This program had 25 institutions participated and they come from HK, Mainland and Overseas. There were more than 2,800 volunteers to complete 44 projects including 37 footbridges, 3 village community centers, benefiting more than 52,000 villagers in underprivileged areas of 7 provinces in China. The multiple functions of the project was showed in the following diagram. Prof. Encoh Young (Director Emeritus, HKU SPACE) was the moderator. The fifth speaker was Prof. Andrew Chan (Associate Dean, Faculty of Engineering, University of Nottingham, Malaysia) and his presentation topic was “Aerodynamics and Pollutant Dispersion Near Tree Canopies in Urban Areas”. Prof. Chan explained the flows and dispersion in urban street canyons using wind tunnel and computational simulations. People knew that trees removed air pollutants, release oxygen offset communities’ carbon footprint, reduce storm water runoff, save energy and provide wildlife habitats. However, trees might amplify pollutant concentration levels due to the trapping of traffic emission as a result of restricted ventilation, reduced dispersion and dilution. Some trees also produce significant amount of biogenic volatile organic compounds which would lead to urban ozone. Prof. Chan used using wind tunnel and computational simulations for Tree Crown Modelling. In his study, target tree species including Taiwan Acacia, Hong Kong Orchid Tree, Paper-bark Tree and Horsetail Tree used for germinating chamber studies for TVOC emission. It was found Taiwan Acacia had less TVOC emission rate compared with other species. Prof. Chan concluded the location and species of tree in urban areas was important for environmental impact. The sixth speaker was Dr. Shirley MC Yeung (Director, Centre for Corporate Sustainability and Innovations, HSMC) and her presentation entitled “Environment Creation for Sustainable Learning”. She introduced BBA-SCM Yr4 student’s course and criteria. Then Dr. Yeung showed their video education program named “Entrepreneurship Spirit for Corporate Sustainable Development” and “SCM4201 – Current Issues in Supply Chain Management & Logistics” using YouTube. Then Mr. Tsa said there were three goals included “Accessible”, “Affordable” and “Transferable”. The technology should be “Adaptation”, “Interaction” and “Collaboration”. He introduced some of products named “TeamNote” and “mPub”. The last speaker was Ms. Katherine Lau (General Manager, Corporate Quality & Sustainability) and his topic named "Good Practice in Higher Education on Carbon Reduction for Responsible Management and Student Engagement". Ms. Lau introduced Fuji Xerox Zero Carbon Operation through their product and operation practices. She said we made sustainability to be part of operation. Mr. Martin TF Tam (Registered Architect, Founder of Ablemart Limited, HK) was the moderator. Dr. Shirley Yeung took a group photo with guest speakers. Before end of the forum, we took a group photo for memory. Reference:I met Dr. Shirley Yeung in HKQAA Symposium on 28th Nov 2014. 作者筆名劍如虹，畢業於香港城市大學及香港理工大學，學術範圍包括應用科學，應用物理，電腦，化學及環境工程等，以業餘時間攻讀完工程管理博士學位。由於喜歡武俠故事式電腦遊戲，才引發奇想，把品質管理理論用武俠小說方式表達。作者現任職品質經理，曾多次於專業學會主辦的國際會議和學術期刊發表論文及研究報告。 Dr. Lotto Lai has 20 year hands-on experience in scientific research, quality assurance and management in Commercial Laboratory, University Testing Centre, Certification Body and Consultants Firm. He is Former Chairman & Fellow in HKSQ, MHKIE, FASQ, CMQOE and IRCA QMS Lead Auditor, as well as, Asso. Academician in IAQ.